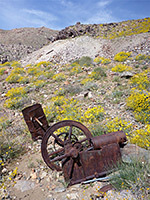 Contact Mine, one of several hundred prospecting sites in Joshua Tree National Park, was active in the 1920s and 1930s, producing small amounts of silver and gold, after which it was abandoned, leaving shafts, spoil heaps and an assortment of rusting machinery. 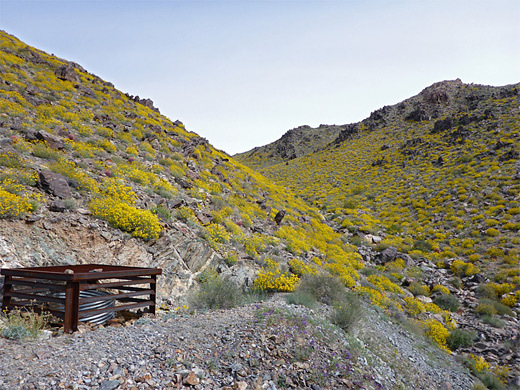 The mine is tucked away towards the upper end of a canyon in the rocky hills east of Queen Mountain, 4 miles south of the park headquarters in Twentynine Palms, and close to several others including the better-known Desert Queen Mine. The site is reached by an unmarked, unmaintained though not difficult trail, 1.8 miles in length, which ascends 700 feet, mostly over the second half which is along a disused track; the earlier stages are nearly flat, following a wide, dry wash and a short ravine. 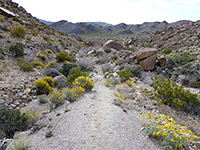 Wildflowers are particularly abundant in the spring, growing in three types of habitat - the sandy flats around the lower end of the wash, the rocky, sometimes moist and shady confines of the ravine, and the exposed slopes higher up. Lizards and snakes are plentiful, and desert tortoises may also sometimes be seen. 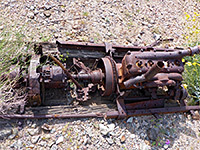 16 views of the Contact Mine Trail. The path starts at a pull-out on the west side of the road half a mile south of the entrance station, directly opposite a short track leading to the eastern trailhead for the park's section of the California Riding and Hiking Trail. A notice describes some of the local plant life and geology, though it does not mention the mine. A few hundred feet south on the far side of a ridge is another abandoned mine (Anaconda), visible from the road and also quite easy to explore. 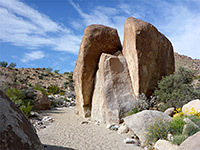 The narrow but well-defined path heads southwest over a bushy, sandy flat, reaching the edge of a wash after 600 feet, on the far side of which are two piles of large boulders. The next section of the route is up the wide wash bed, which lacks any rocks or thick undergrowth, and its floor of firm sand makes for easy walking. The wash divides soon after another bouldery hill to the north, and the path resumes up the low ridge between the two forks, following close to the northern branch. An alternative is to stay in the wash; this narrows somewhat and has a few pretty bends, between shapely granite boulders. The trail descends back to the floor of the wash just as another tributary joins from the north, then continues up the far side, again between the two drainages, the larger of which continues all the way to the mine, though the upstream section is temporarily much more difficult to follow, containing many big rocks and one sizeable, sloping dryfall, so the path is definitely the best way to continue. 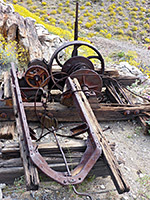 The trail, now recognizably an old vehicle track, climbs over stony slopes, round a broad basin and over a saddle, where it turns north, heading directly to the mine, which is visible from some distance away. The route gradually descends towards the streambed, then narrows and fades away in the vicinity of the mine spoil heaps. Just above these are three shafts sealed by iron grills, while nearby are several large pieces of rusting machinery including an engine, motor, winch and compressor, plus many smaller items, of wood, metal and glass. A short section of rails run from one shaft to the edge of its spoil heap. 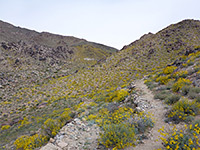 All around are steepish slopes covered by small boulders, mingling with red-spined ferocacti plus innumerable brittlebush plants, producing a profusion of bright yellow flowers in the spring.